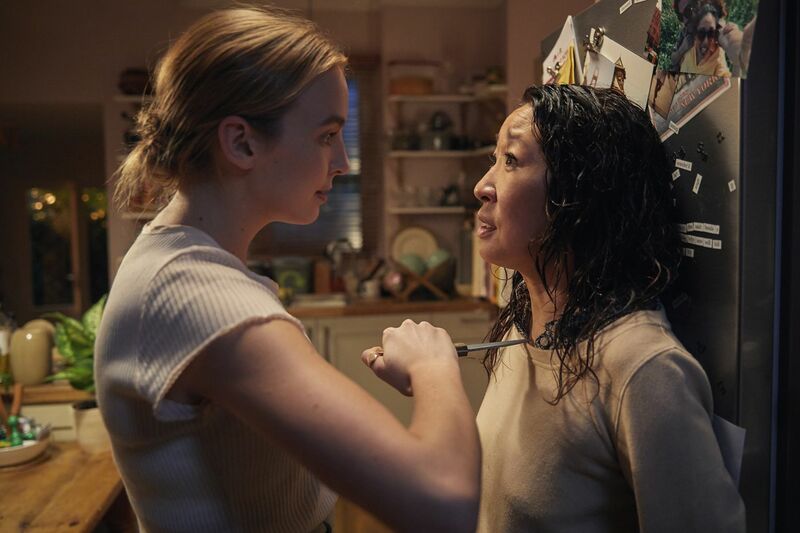 Jodie Comer (left) as Villanelle and Sandra Oh as Eve Polastri in a scene from BBC America's "Killing Eve." Is there anything more arbitrary than a Top 10 list in a 500(ish)-show universe? I won’t pretend to have seen everything that showed up on all the TVs and tablets and phones in 2018. I won’t even pretend to remember all the things I have watched. The Americans. I try not to judge shows by how they end, but it didn’t hurt that Joe Weisberg and Joel Fields' FX drama about Soviet spies in Reagan-era America wrapped up its six-season run in May with an episode that, as I wrote then, “defied my belief that this thing could only end badly by ending very well indeed.” Watching undercover suburbanites Philip and Elizabeth Jennings (Matthew Rhys and Keri Russell) do terrible things (while wearing fabulous wigs) in support of a cause they couldn’t know was futile was an exhilarating ride, but The Americans was at its best when it examined the values and attitudes we think of as “American” and let us see ourselves as others might. Where to watch it: Amazon Prime Video has all six seasons, as does FX’s premium service, FXPlus. The Handmaid’s Tale. Speaking of not judging by finales: Yes, this season of TV’s most harrowing cautionary tale — if you don’t count the ones playing out on cable news — ended with some of us wincing (or screaming) as Elisabeth Moss’ Offred/June made a certain Lost-like decision. It’s still a TV show, even if it’s on Hulu, and TV shows, to continue, sometimes require their characters to do things that make no sense whatsoever. Beyond that, though, this was a strong season, one in which the writers had to leave the confines of Margaret Atwood’s 1985 novel about a post-U.S. theocracy in which women have been stripped of all rights. Yvonne Strahovski particularly shone as Serena Joy, who learned, to her sorrow, that being a privileged member of a group with no actual privileges left her no safer than Offred, the woman forced to carry “her” child. Where to watch it: Hulu. The Marvelous Mrs. Maisel. Sneaking in under the wire for 2018′s list, the second season of this addictive comedy from Gilmore Girls creator Amy Sherman-Palladino launched Dec. 5. And it’s even more charming than the Emmy-winning first run. Rachel Brosnahan stars as Midge Maisel, a 1950s homemaker-turned-comic whose road to standup stardom, while occasionally rocky, is a bit of a fairy tale (as Sherman-Palladino’s stories tend to be). But then not everything that’s good has to be grim. The new 10-episode season, which kicks off with a visit to Paris, makes better use of Tony Shalhoub and Marin Hinkle as Midge’s parents; gives Michael Zegen, who plays Midge’s ex, Joel, more to work with; and continues to have fun with Alex Borstein’s Susie, whose job as Midge’s manager proves ever more complicated. The addition of Zachary Levi (Chuck) in a recurring role only made things better still. Where to watch it: Amazon. The title character from "Teddy Perkins," the sixth episode of this past season of FX's "Atlanta." Atlanta. Even if it hadn’t included the creepy “Teddy Perkins” — one of the most remarkable episodes of television of 2018 — the second season of Donald Glover’s Peabody Award-winning dramedy for FX would’ve been unsettling. Dubbed “Robbin' Season,” it found, week after week, new ways to place its characters in situations that were precarious in ways that undercut their growing prosperity. Because in Atlanta, money doesn’t necessarily buy love, or safety, or even respect. Where to watch it: Hulu has the first season and a deal to stream the second. If you can’t wait for it to arrive there, it’s on the premium service FXPlus. Episodes also are available for streaming purchase on several sites, including YouTube, Amazon, and iTunes. The Good Place. Broadcast TV is still the place to find many of the best comedies — the kind that make us laugh out loud, not just scratch our heads. So just because you don’t see CBS’s The Big Bang Theory or ABC’s Black-ish, Speechless, or Fresh Off the Boat in my drama-heavy Top 10 doesn’t mean they’re not all still great. NBC’s The Good Place, a comedy from Mike Schur (Parks and Recreation) about an afterlife in which its characters have been judged and found wanting, stands out from the crowd for engaging weighty philosophical issues with laughter, for its continued surprises, and for making the best possible use of Ted Danson as a demon on a mission to save himself and his charges. Where to watch it: NBC, 8:30 p.m. Thursdays. Catch up on the third season through On Demand or NBC.com. First two seasons are on Netflix. Counterpart. Oscar-winner J.K. Simmons (Whiplash) playing opposite himself would be reason enough to watch this sci-fi spy drama set in Berlin, in which he plays Howard Silk, a frustrated functionary in a bureaucracy whose purpose he doesn’t understand, as well as his decidedly opposite number in a parallel universe linked to his own by a carefully monitored border. But there’s also Olivia Williams as Emily, who’s one Howard’s wife, the other’s ex, and a story that’s as evocative of Homeland as it is of Fringe. Where to watch it: 9 p.m. Sundays, Starz. Second season premiered Dec. 9. First season available on Starz platforms, or for streaming purchase. Killing Eve. Like Counterpart, this BBC America thriller is the story of someone who’s long been underestimated and who finally gets a chance to be part of the action. Grey’s Anatomy veteran Sandra Oh stars as Eve Polastri, an MI5 desk jockey in London who becomes obsessed with a female assassin (Jodie Comer, The White Princess) who only she seems to realize exists. When Comer’s character, who calls herself Villanelle, becomes equally fixated on Eve, the dangerous fun begins. Where to watch it: Hulu. BBC America also plans a full-season marathon on Dec. 22. Homecoming. One of TV’s happiest trends has been the rise of the half-hour drama, and this one, adapted from a scripted podcast and directed by Mr. Robot creator Sam Esmail, rewards short attention spans with a 10-episode thriller that satisfies without exhausting. Julia Roberts stars as social worker Heidi Bergman, whose work counseling returning war veterans may not be all it seems, even to her. When Heidi takes a particular interest in one of her patients, Walter Cruz (Stephan James), things begin to unravel. Where to watch it: Amazon. The Haunting of Hill House. I tend to be horror-challenged, so when I say this is one of the best family dramas I’ve seen in a while, you know that Mike Flanagan’s reimagining of the Shirley Jackson classic gave me reasons enough to uncover my eyes and take it all in. You don’t have to have spent any part of your childhood in a house full of ghosts to recognize the dynamics at work among the Crains. Still, if you’re into house-flipping shows, this one might be a bit too scary. Where to watch it: Netflix. Madam Secretary. It’s not easy to be a network drama in a world in which cable and streaming series get all the attention, and it’s even harder to be a political drama at a time when real-life politics are stranger than fiction. Yet week after week, Barbara Hall’s drama about a U.S. secretary of state (Téa Leoni) tackles real-world issues in the kind of depth that TV news seldom does and manages to make it entertaining, too. Where to watch it: CBS, 10 p.m. Sundays. Some other standouts of 2018: CBS All Access’ The Good Fight; Showtime’s Patrick Melrose and Kidding; Cinemax’s C.B. Strike; HBO’s Succession, My Brilliant Friend, and Insecure; Netflix’s GLOW and One Day at a Time; AMC’s Better Call Saul; Facebook Watch’s Sorry for Your Loss; USA’s The Sinner; and the CW’s Crazy Ex-Girlfriend.